Waist length pieptar edged with black velvet and a band of red leather, and decorated with isolated motifs of red and green embroidery, and woollen tassels on the front. Chemise (Cămașă cu mâneca din gât) made of white linen with gathered neck and wide frills (fodor) on sleeves, these opening out below a row of embroidery just under the elbow, with a wide row of white crochet lace attached at the wrists, this style of decoration being known as cămașă cu şire peste cot. 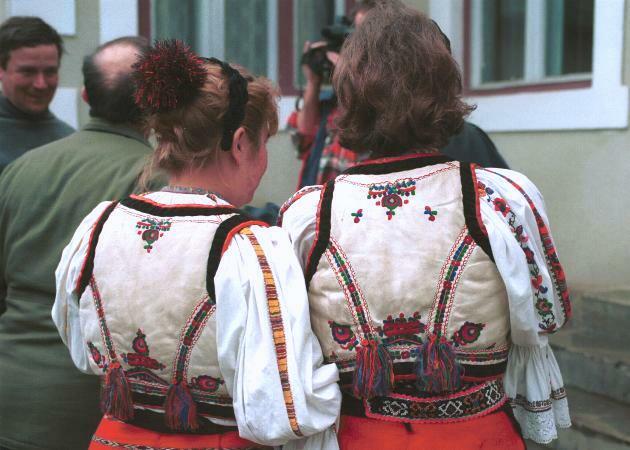 It has a narrow band of embroidery at the neck, in the same style as the necklaces (zgardane) worn further north in Maramureș. Gathered black silk apron (șort), decorated with embroidered ribbon on edges. Photo taken in Lupșa, Valea Arieșului, Alba, April 1994.